Last Monday, we supported one of our members to stop the eviction of her and her daughter from temporary accommodation provided by Southwark council. By emailing and tweeting Southwark councillor Stephanie Cryan and the manager for housing, we were able to get Southwark to stop the eviction. You can read our tweets here and thanks to everyone for the retweets and tweets in support as it makes such a difference (please keep on following our social media and sign up to our email alerts for future online support). D and her daughter had only been given a weeks notice from the council that they would be evicted. Due to this short notice, they had not been able to get an appointment at the Citizens Advice Bureau. The eviction was due to rent arrears caused by problems with Universal Credit. D had been in touch previously with the council and they were aware that she had taken steps to deal with the arrears. D is a single parent who does not speak English as her first language. So why were the council being so quick to evict her? This attempted eviction is not a one-off case. Threats of eviction from temporary accommodation due to rent arrears has become a familiar problem in our group. We have supported 5 other members with this problem this year. 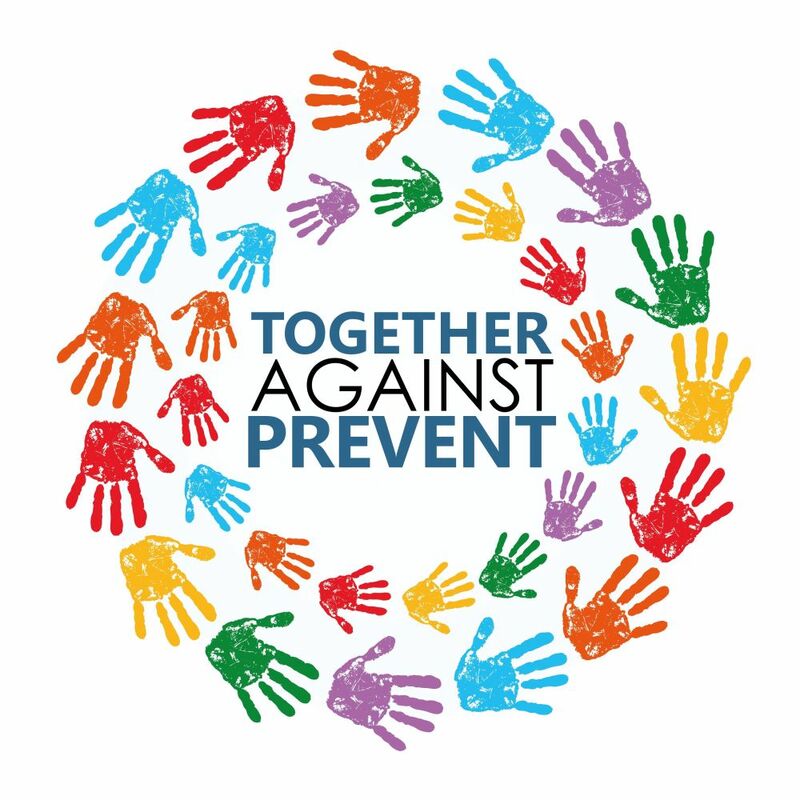 There must be many more people who our group has not met who are affected by this problem. One of these families was forced to leave her home but was re-housed the same day after we supported her at the housing office – during the move from one temporary accommodation to the other, her 3 year old daughter broke her leg. Homeless households are already a vulnerable group. Why are Southwark council being so quick to evict them? Problems with universal credit, low paid and insecure work, and high temporary accommodation rents all mean that it is very easy to fall into rent arrears. Instead of evicting people, homeless households need support to deal with these problems. No one should be evicted from temporary accommodation. As well as being wrong, we think that some of these eviction threats by Southwark council may be unlawful as the council have told families in temporary accommodation flats that they must leave, but the council have not got a court order which can be required for some types of temporary accommodation. 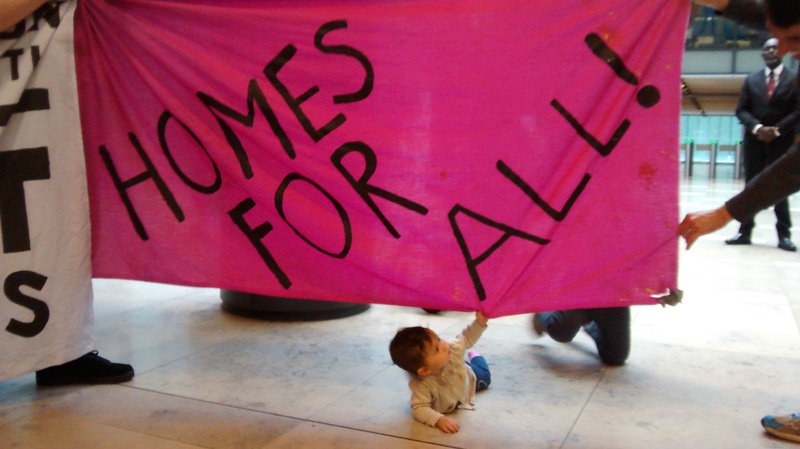 We are calling on Southwark council to stop all evictions from temporary accommodation and give support to homeless households who are in rent arrears. Homeless families need secure, quality, council homes not evictions! This entry was posted in Uncategorized and tagged council housing, evictions, Southwark, southwark council, temporary accommodation on October 8, 2018 by housingactionsl. Solidarity with Ledbury estate tenants from HASL! Shortly after the Grenfell tower tragedy, Ledbury residents were informed by their landlord, Southwark council, that their tower blocks were unsafe (although the tenants had been raising concerns about the disrepair of their homes before this). In fact, they were death traps. Since August this year, Ledbury residents have had their gas turned off and many residents have moved into temporary accommodation. Those that have remained in their homes are living without gas making daily living very difficult. Many of HASL’s members are people who are dealing with homelessness and poor quality private housing. We often find ourselves challenging Southwark council over their poor treatment of us. The neglect, disrespect and contempt that the council shows towards homeless and poorly housed people also extends to their own tenants as the Ledbury tenants have highlighted themselves. The Ledbury tenants have raised poor communication by the council and the council’s failure to meet the simple and basic demands of people directly affected. We know this (mis)treatment very well. 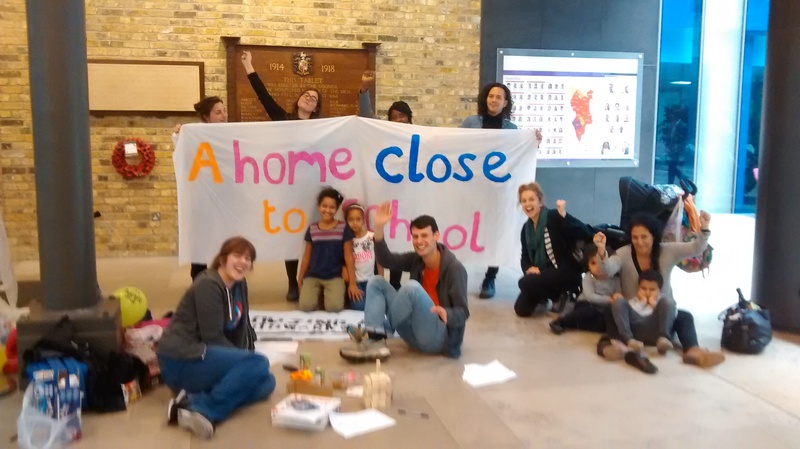 As many of our members struggle for the secure council housing they need, the Ledbury tenants are having to deal with Southwark’s long term neglect of this vital housing stock. We support the Ledbury tenants campaign for their rights for safe and secure homes and to be treated with respect. Why was Southwark council not taking action on fire safety in 2009? But the current crisis on the Ledbury Estate should never have been left this long. It was only the fire safety inspections after Grenfell that the structural problems were discovered. However, there had already been a deadly fire at Lakanal Tower in Camberwell in 2009. Southwark council should have been leading the improvement in the safety of their council housing since then – their failure to do so left hundreds of families in danger. Instead of inspecting and improving fire safety on their estates, Southwark council has been busy demolishing thousands of council homes. And it is this demolition of council homes by Southwark that is making the Ledbury crisis even worse for everyone involved. The Ledbury residents will be having to wait longer for re-housing into council stock and HASL members, and other homeless Southwark residents, will be pushed even further down an ever lengthening queue for council housing. Ledbury residents have also highlighted the unsuitable temporary accommodation they are being provided with by Southwark council. Again, this is a huge issue that we face in our group and have also highlighted and taken action on. Southwark council is currently the worst council in the country for keeping families in B&Bs for over the 6 week legal limit and they have almost quadrupled the amount of homeless households they are housing outside the borough in the last 3 years. Southwark council need to drastically improve this appalling record – homeless households must be given suitable and local temporary accommodation. The Ledbury Action Group has organised a number of protests with a list of the problems still faced by the residents months after the council realised the seriousness of the housing conditions. We fully support the residents’ basic demands for decent living conditions and respect. Stop decanting Aylesbury estate council tenants now! If estate clearance is stopped it will relieve pressure on the council waiting list immediately. Re-furbish all empty council stock. The Aylesbury Estate has hundreds of empty flats on it which they are currently pulling down. There are still hundreds of flats that have only had minor damage (done by Southwark council to make it uninhabitable for squatters) and they should be urgently made liveable again providing local housing for those on the council’s waiting list. Housing in Southwark and London is in crisis with people stuck in in poor quality, expensive private housing or neglected council housing. It is important to hold Southwark council accountable for their role in this crisis. We all deserve answers about why Southwark council does not respond to the concerns of their residents (be they homeless people, private tenants, or council tenants), why fire safety checks were not done sooner, and why good quality council estates, like the Aylesbury, are being demolished, against their residents wishes. This entry was posted in Southwark, Uncategorized and tagged fire safety, Ledbury estate, southwark council, temporary accommodation on October 5, 2017 by housingactionsl. HASL get member housed back in her community! 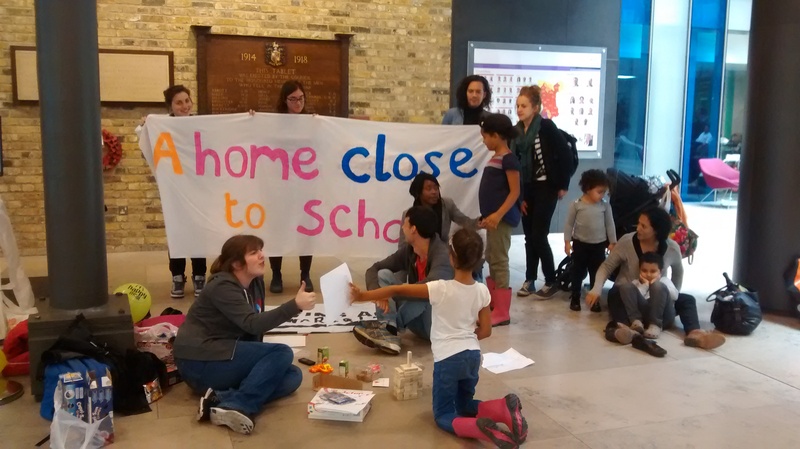 Yesterday morning, about thirty HASL members and ESOL group English for Action, visited Southwark council’s town hall in support of our member Ruth and her family who had been housed by the council all the way out in Woolwich. This accommodation was far away from their school, community and work places. To get to school her children had to travel on 3 buses for 2 hours, and then they had to do this after school to get home again. That’s 20 hours commuting each week on 30 buses! This was having an extremely negative impact on the children’s education and well being. Everyone needs and deserves decent housing in their community. We won’t let people be forced out. 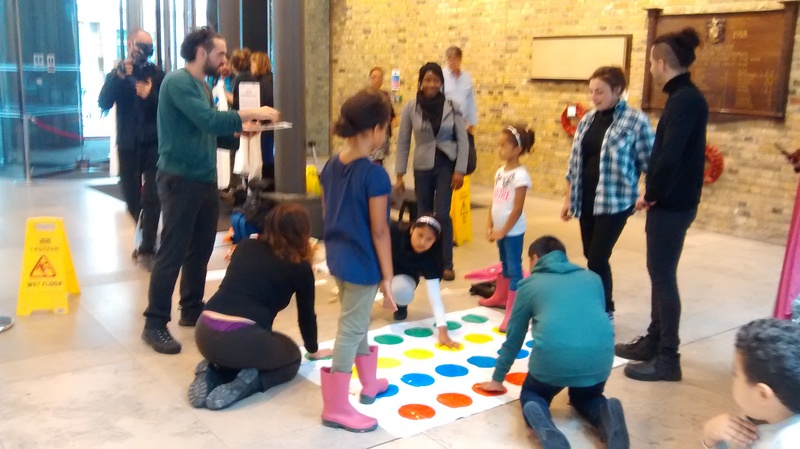 We went to demand ‘A home near school’ and after a short time in the town hall’s lobby – where we played Twister, Jenga, and talked with staff about the housing crisis and our group – we were told that alternative temporary accommodation on the Aylesbury estate* had been found for the family. Ruth was relieved and happy at the outcome, as we all are that Ruth and her family are now back home. But it shouldn’t take 30 people occupying the town hall for homeless people and families to be treated well and provided with suitable temporary accommodation. And we were appalled by one housing managers comments when we asked him why no furniture (no beds!) was provided in the accommodation – “it’s got a roof, it’s liveable”. We doubt he’d call this liveable if it were provided for him and his family. This is no standard or way to treat homeless people. We want to challenge the poor treatment and provision for homeless people in Southwark and fight social cleansing! Get involved in HASL to help us do this! Thank you to everyone who came and supported Ruth. Don’t struggle alone! Together we can win! *The Aylesbury estate is in the process of ‘regeneration’ (demolition of council housing and its replacement with unaffordable private housing = social cleansing). Secure tenants are being moved/forced out leaving perfectly habitable flats empty. Southwark is using some of these flats to house homeless people (and collect rent from them!). This seems sensible enough as it keeps people in their home borough (and makes Southwark council money). We oppose the demolition of the Aylesbury estate and support all residents and locals who are fighting for it. Check out Fight for the Aylesbury for more information and action. This entry was posted in Action and tagged homelessness, social cleasning, southwark council, temporary accommodation, win on August 28, 2015 by housingactionsl. 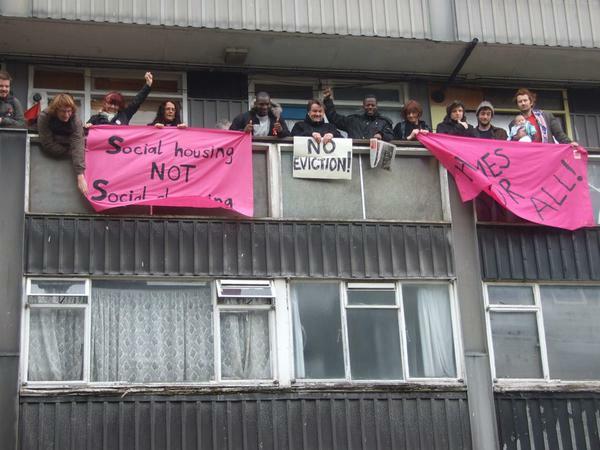 Eviction resistance success in Camberwell! This morning, around 40 people (including residents from the nearby Aylesbury estate campaign, Eviction Resistance, Revolutionary Workers Party, neighbours, and us!) squeezed onto a narrow balcony in Camberwell responding to a call out from 14 year old Saffi to help stop the eviction of her family by Southwark council. Saffi, her sisters, mother, and grandmother are being housed by Southwark council in temporary accommodation, but as Saffi says, they have been continually evicted by the council and moved about – including being sent out to Plumstead. They are currently living on an estate that the council has marked for demolition. The council were trying to evict the family for alleged rent arrears. They have lawyers who are appealing but in the mean time, collective action kept the family in their home. HASL have come across a similar situation which we wrote about here, where they evicted a family in temporary accommodation over alleged rent arrears and declared them ‘intentionally homeless’. But having rent arrears does not automatically make you ‘intentionally homeless’ as Southwark council seem to believe. We’ll be keeping an eye on Southwark over this. Bailiffs and builders hid round the corner talking with a couple of police after witnessing the balcony full of people and banners determined to block their way. 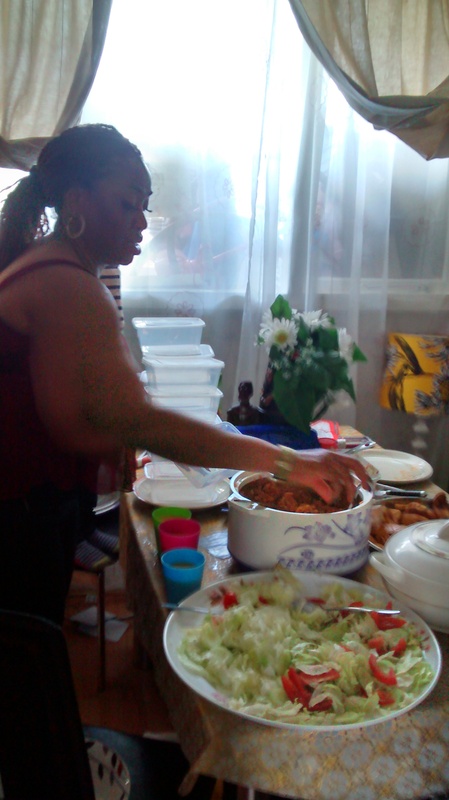 Once we were sure the bailiffs had gone, Saffi’s mum delivered a powerful victory speech and invited us all in for a victory feast of jollof rice, chicken, and plantain. A moving and inspiring morning! Thanks to everyone who came down! If you’re facing eviction or worried about any other housing or benefit problems, you’re not alone, get in touch with your local group so that we can support each other and win! If you live in Lambeth or Southwark join HASL’s eviction phone network here and follow Eviction Resistance, London Coalition Against Poverty, and Radical Housing Network for housing action beyond Southwark and Lambeth. 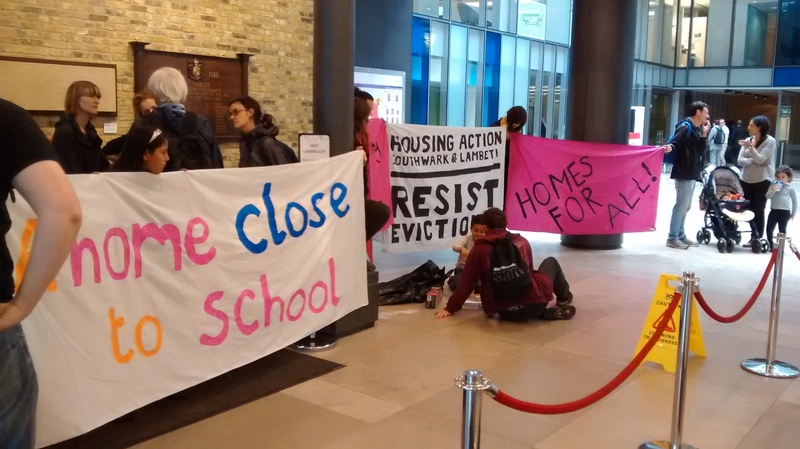 This entry was posted in Eviction Resistance and tagged Camberwell, eviction resistance, homelessness, southwark council, temporary accommodation on May 5, 2015 by housingactionsl.